I'm raising money for basic needs so I can be a full time student. Verified by Mission Economic Development Agency (MEDA). Why I'm using HandUp for my basic needs. I have been accepted into San Francisco State University College of Business to pursue my accounting degree!! I have been working toward this goal since the spring of 2015. It has been challenging to stay on this long term path especially as I navigated personal obstacles in my life. However, I managed to maintain a high GPA and will be moving on from my community college with honors. Although college as a single-parent-student has been a challenge it has made me very happy. It is with the support of my closest friends and my HandUP donors I have achieved my dream of pursuing higher education. I want to take this special opportunity to thank my many donors who have supported me along my journey and over a course of many years. 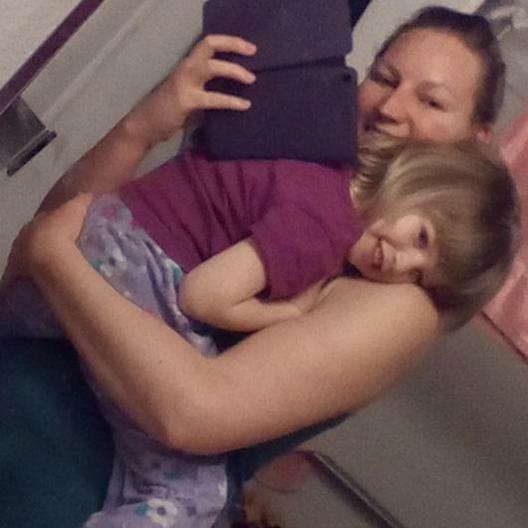 My daughter and I started out homeless, and it wasn't until a couple of months after we brought her "home" from the hospital and to a homeless shelter that we gained housing. It was at this same time I was introduced to the HandUP community. We have met many donors since then and have shared many moments together. I will no longer be setting fundraising goals on HandUP, but I will be posting updates as I progress through college. I'd like to continue to share my story with you and for you to be able to continue to receive my updates to see how your support has helped me improve my life. Thank you so much for your support! My daughter and I are in the process of recovering from being homeless. She was born August 2013. I brought her from the hospital “home” to a homeless family shelter. When she was 3 months old were placed into housing. Since then I have been working on my long term goal to gain a Bachelor's degree in accounting. In the past I've enjoyed working in the field of accounting as an assistant to accountants, and bookkeeper to small businesses. I am excited to think one day I too could be working as an accountant myself. I first came to San Francisco when I turned 18. I was born in Carson City, Nevada. I attended the Academy of Art University until my limited college funds ran out, about ½ a year. I wanted to become a 3D Animator, this was back in the mid ‘90’s, when Toy Story was all the rage. After dropping out of art school due to lack of funds, I began temping and living in the city. I became an admin assistant, and eventually a bookkeeper. I have worked mostly for myself providing bookkeeping services, payroll services, etc to small businesses for the most part. I am currently attending a California Community College and have been since January 2015. I was able to do this only after I'd secured child care for my daughter. Both she and I started school when she was 14 months old. My educational plan is to begin at a State University as a transfer student in the Fall of 2018. While I am attending a University I plan to support myself and my daughter by offering bookkeeping services to small businesses. Not only am I comfortable working for myself as I have in the past, but the experience will update my resume and prepare me for seeking work as an accountant after I graduate with my BBA in accounting in 2020. Once I am able to secure work experience as an accountant for one year I will be able to enter the master’s program and train to be a CPA. I would like to integrate my bookkeeping service business into a non-profit after I graduate with my CPA license. I began with the goal to become a CPA in 2015 and I will have reached my goal in the year 2021. My daughter will have grown to be 8 years old. Only after I have met all these goals moving forward will I be able to fully provide for myself and my daughter and maintain our residence in the Bay Area. This is an important stepping stone for us because I plan to remain in the Bay Area and work in community. I plan to organize a non-profit based in the foundation of accounting. My non-profit mission will be to promote families to overcome poverty through stable financial management. Besides pursuing my education, I inspire the founders of leading local non-profit programs and also join them in their missions to end family poverty and homelessness. As I have been a client of their programs, and volunteer in their programs, I see a need for an additional program to help families acquire stable financial management to end the cycle of family homelessness. With my accounting degree, my home business, my CPA license, and connection in community I will be able to educate families in accounting and finance management in order for them to overcome poverty and homelessness. Other things I'd like to share about myself. My experience of being homeless, and recovering from homelessness in San Francisco has made me aware of what an amazing community we live in. Never had I thought I would become so reliant on others. It has been an extremely frightening experience at times, but it has also been an extremely heartwarming experience at others. I am looking forward to future opportunities to volunteer our time and share our experience to support the many different Organizations working to better those whom are struggling due to homelessness and recovery from homelessness in San Francisco. I was lucky enough to be asked to speak at a meeting between Handup and Google in November 2014. I shared my experience of the impact HandUp has had on my family with Google Bay Area Portfolio Manager, Justin Steele. Justin included HandUp as a grant beneficiary in a portion of the $2 million awarded to the San Francisco Mayor's Office to support select homelessness recovery programs in San Francisco. In 2012, Guido The Cat, raised money to place our service animal, Bubba-Roo, in Pet Camp while we ourselves were placed into The PAATH Program which was at a non-pet-friendly hotel as we awaited family shelter placement. Without Guido’s help we may have lost our dedicated service animal of 12 years. 100% of your tax-deductible donation goes to Julianne through Mission Economic Development Agency (MEDA). For full accountability, donations go through trusted community partners. I'm raising money for basic needs so I can go back to school for Early Childhood. Be the first to donate to Isaac this month! I'm raising money for basic needs so I can afford household items like cooking utensils and linens for my new housing. Be the first to donate to Johnathan this month! I'm raising money for basic needs so I can food and clothing. Be the first to donate to Michael this month! How far does your donation go? HandUp makes money through the optional tips you can add to your donation. That way, 100% of your donation goes where you intend with the help of our local nonprofit partners. 90% of donors opt-in to HandUp tips. You'll start to receive updates in your email on Julianne's progress.